Today, the Rhode Island Commemorative Silver Half Dollar Coin remembers when Representative Davis put forth a bill on April 18, 1899 to revoke the expulsion of Roger Williams in 1635. Met according to adjournment, at hall-past ten o’clock A.M. Prayer was offered by the Chaplain. By Mr. Davis of Cambridge, petition of Cephas B. Crane and others that the sentence of expulsion passed against Roger Williams by the General Court of Massachusetts Bay in 1635 be revoked. Referred, under the 12th joint rule, to the next General Court. Whereas—The General Court of Massachusetts Bay—at their session in Cambridge (New Town) Mass., passed a sentence of banishment—against Roger Williams—Oct. 19, 1635. Whereas—Hon. John Winthrop, first Governor of Mass. Bay—requested that Roger Williams be recalled—his sentence revoked—and he duly honored—which was refused. An Act—Revoking said sentence of Banishment—and your petitioners—will ever pray. In the year one thousand eight hundred and ninety-nine. Resolve to provide for the revocation of the sentence of expulsion of Roger Williams, passed by the General Court of Massachusetts Bay in 1635. Resolved, That the sentence of expulsion passed against Roger Williams by the General Court of Massachusetts Bay in the year sixteen hundred and thirty-five be revoked. The long delay in presenting the Petition prevented any action, for the reason that the time had expired in which new business could be presented; it was referred, under the rule, to the next General Court. It was published in Boston in 1892, by Bradley & Woodruff. The author is a Baptist clergyman, brimful of Baptist bias, and his book not only preserves all the old errors, but creates new ones; Book Notes called attention to some of them at the time the book was issued. This revocation scheme has once before been tried, and failed, let us hope now that the result will be the same; it is absurd nonsense. A revocation can change nothing. The General Court acted sufficiently erroneous in 1635; everybody knows that it would do no such thing now; but why attempt to expunge a record which cannot be expunged. 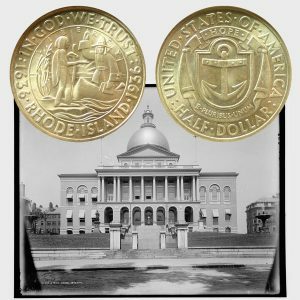 The Rhode Island Commemorative Silver Half Dollar Coin shows with an image of the Massachusetts state house, circa 1899.